Daniel Chopra earned a spot in next year's Mercedes-Benz. KAPALUA, Maui » Involved in the first PGA Tour playoff of their careers, Steve Stricker and Daniel Chopra acted like it after both missed makable birdie putts time and time again yesterday before Chopra sealed Stricker's fate with a tap-in birdie on the fourth extra hole to win the $5.5 million Mercedes-Benz Championship. As the sun barely hovered above the horizon along the West Maui coast, both golfers three-putted the first extra hole at the 18th, forcing them to head to the first tee. It took a while to settle the overflow crowd, but both hit good drives straight toward the sun and had good looks at birdie in the failing light. As had happened to Chopra on more than one occasion yesterday, including the last hole of regulation, he kept leaving his putts a roll or two short of finding the cup. He thought he had a birdie at the second playoff hole, only to watch it die at the hole. Even his eagle try at the fourth extra hole hovered at the edge, much like Tiger Woods' ball at the Masters two years ago. 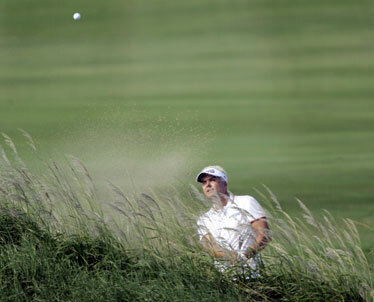 But unlike Woods' golf ball, Chopra's wouldn't fall, allowing Stricker a chance to send it to the fifth playoff hole. He pulled his 15-footer a shade left, allowing Chopra to win the biggest golf tournament of his young career. "It was an unbelievable day really," Chopra said. 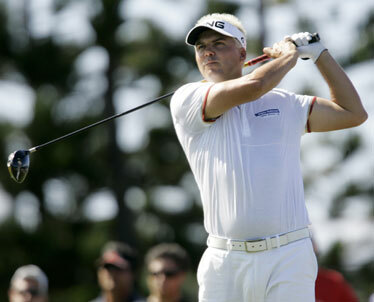 "I felt very comfortable all week, really. I guess the win (last year) made me more comfortable. I felt like I did belong now and I was a winner. There's not a golf course out there that suits me more." Despite the disappointing loss, Stricker found a positive in it. "This is definitely a good start for the season, a little bittersweet," Stricker said. "I'm very pleased with the way I played. I can be a little disappointed, I guess, because I didn't win." KAPALUA, Maui » The fourth hole of the fourth playoff since the $5.5 million Mercedes-Benz Championship moved to Maui was a spiritual moment for Daniel Chopra. Having the fates treat him unkindly several times down the stretch, Chopra finally got a putt to fall -- albeit from a 10th of an inch -- to beat Steve Stricker in one of the more dramatic moments in Mercedes history. Chopra could have avoided all the fun had he sunk a 12-footer for birdie at the 72nd hole, but he left it a roll short, allowing both golfers to be in the first playoff of their PGA Tour careers. Chopra got there by firing a 7-under 66 that left him at 18-under 274 for the tournament. Stricker countered with an even better final 18 holes, shooting a 9-under 64 that included holing an eagle at the par-4 12th from 52 yards out and birdieing the last from 12 feet to finish 18 under for the tournament as well. Stricker's phenomenal finish got the attention of Chopra, who believed his three straight birdies on holes 11-13 would be enough to seal the deal. Down the stretch, he caught a bad break at the par-5 15th when his second shot came up to the green, then trickled down in front. He chunked into a sprinkler head and eventually had to settle for par at the easiest hole on the course, giving Stricker enough room to catch him with his birdie at the last. "When I birdied 13, I thought, 'Wow, I'm going to run away with this thing,' " Chopra said. "I look up at the board, and I'm only ahead by one. I'm going, 'What the hell do you have to do?' This is the final round, it's supposed to be pressure-packed, and it's hard to put a win away. "I'm 7 under for the day, two ahead of Stricker for the day, and he's right there behind me. He birdies 18 and all of a sudden now I've got to birdie 18 just to win. You know what, definitely by far the best final round I've ever played to win a tournament, actually just to get in a playoff. But seven birdies, no bogeys, I've always dreamed of having a bogey-free round to win a golf tournament and I managed to do it today." But even then, it wasn't easy. The first extra hole returned them to the 18th, where both golfers had chances to sink makable birdies, only to see Stricker's 10-footer break left and Chopra's 8-footer go right at the hole. Daniel Chopra blasted out of a bunker and onto the ninth green yesterday. Chopra would save par and go on to win the Mercedes-Benz Championship. Chopra had another birdie putt at the second playoff hole from 18 feet just turn at the last instant off a blade of grass to keep him from winning, building the tension between the two as they went to the par-3 second hole. The sun was so low at that green, Chopra had to put his visor on crooked to block the light as he studied the putt. He decided against keeping it that way, shielding his eyes instead, before standing over the ball and missing that birdie try as well. Stricker's 15-foot putt appeared to be headed toward the hole, but it turned left with the grain, sending them on to the par-5 ninth. It was here where Chopra gained a distinct advantage. Both hit good drives in the fairway, but Stricker yanked his second shot into the deep rough on the left side of the green, giving Chopra a chance to do some damage. He took advantage of it, hitting it to the center cut of the green, only 23 feet away from an eagle. Stricker came out of the thick stuff, but it rolled 15 feet past the hole. Chopra had a chance to win it, but his eagle putt hung on the lip and just wouldn't fall, no matter how long he waited. He tapped it in, then watched as Stricker's ball went wide left to give him his second win on tour in his last three tournaments. "I was nearly positive he was going to make it," Chopra said of Stricker's last putt. "Those putts, the first one in the playoff, I thought I hit a beauty. He hit the ball to the left. We were positive mine was going to go that way, too. And it just hung up on that high side. And then the one at the second playoff hole, I don't know how that hung on the lip. "And then when the eagle putt hung on the lip, which I'm positive, 100 percent, it has to go, especially when the whole green goes that way, the grain goes that way, the sun is that way, the wind is that way and then it toppled -- I think it almost looked like it backed up. Half the ball was hanging over the hole." Chopra and Stricker weren't the only golfers to take advantage of the perfect conditions. Stephen Ames fired a final-round 66 as well to finish in third, just one shot off the pace at 275. Fellow Canadian Mike Weir, who led after 54 holes, overcame a disastrous start where he hit his opening drive into the bushes, to shoot a 3-under 70 to land alone in fourth at 16-under 276. Jim Furyk (68), Hunter Mahan (64) and Nick Watney (71) finished in a tie for fifth at 278 as 13 golfers managed rounds in the 60s. Only five didn't break par. After opening with an even-par 73, Stricker shot 19 under over his final 50 holes. "It was a lot of fun," Stricker said. "I told my caddie I needed to birdie the last three to get to 19. We knocked it on the green in two on 15 and lipped out an eagle putt there. Birdied 16, and then lipped it out at 17, also. You know, I just had a target number in mind, and it was a lot of fun trying to get there."